$5 Shipping - 3 Days Only! Hurry - take advantage of $5 shipping on any order placed now through October 2 at CWDkids! Enter code CEY102 at checkout to take advantage of this limited time offer. Want to stock up on basics like pajamas, pants and tees for the cooler fall weather? 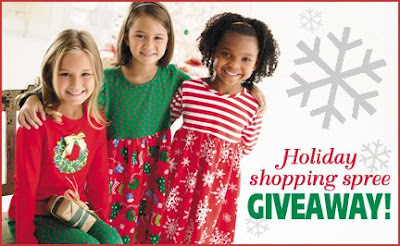 Need clothes for your family holiday portraits? Looking for styles with popular kids' themes like horses, pirates, ballet, sports? Whatever your need, we've got you covered. 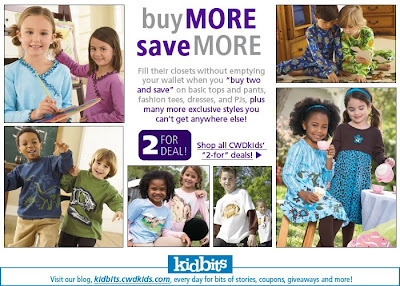 So click here to start shopping for boys, girls, and brother/sister coordinating clothing now so you don't miss out on this terrific deal! Note: Offer is good for standard shipping and handling on order entered at http://www.cwdkids.com/ through October 2, 2008. Express and Overnight charges are additional. Not valid with any other coupons or promotions or on prior purchases. CWDkids' Gift to You for the Holidays! We are giving away a $250 gift certificate to one lucky winner! Include your name and email address so that we can contact you if you are the lucky winner! Entry deadline is December 14. CWDkids will post the winning photo here on kidbits on December 15. CLICK HERE for all Action Hero Tee's including this super-cool Indiana Jones double sleeve tee! 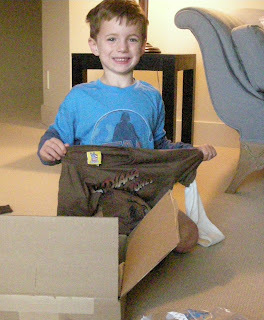 Look how excited Bennett was to receive his new Indiana Jones tee as a gift from his grandfather. Why not give your action hero fan one of our hottest selling tee's before they disappear! 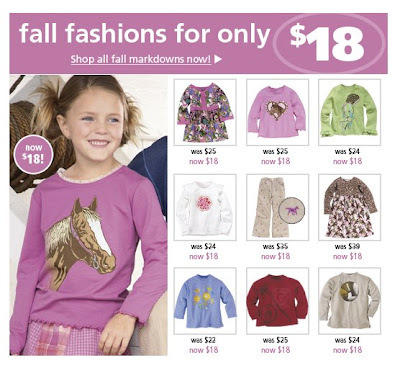 Don't miss out on these popular Fall items only $18.00 each while supplies last! You may remember the CWDkids Care contest winner Avia, who organized a bake sale at her school to raise money for Smile Train, an organization that provides free corrective surgery to children in developing countries who have been born with cleft lips and palates. 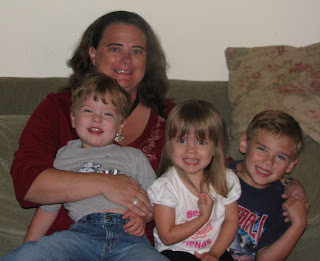 CWDkids rewarded Avia and her classmates by donating $5,000 to Smile Train on their behalf. We would like to share this wonderful letter we received from the Smile Train organization, telling us about one of the children who received surgery thanks to Avia and CWDkids. I am very happy to send you these photos of a young girl we were able to help thanks to your generous support! Sinel Rin is a 5-month-old girl that lives in one of the poorest areas of one of the world's poorest countries. One out of 8 children in Cambodia doesn't make it to their 5th birthday. Most of those who do survive face very difficult lives in a country that has more landmines that it does people and an average income per capita of $290 per year (that's 79 cents a day!). Sinel's parents could save their entire lives and still never be able to afford the surgery that you helped make possible. One of our best surgeons, Dr. Lond Vanna, operated on Sinel this past July 7th at the National Pediatric Hospital in Phnom Penh, Cambodia. As you can see, the surgery went very well. Thankfully, this little girl will never know how painful and difficult her life would have been if she had to live it with the unrepaired cleft. I hope that you put these pictures up on your fridge or someplace to remind you that on the other side of the world there is a 5-month-old girl who is smiling today because you cared enough to help. Thanks again for helping these kids. Junk Food That Won't Spoil Their Dinner! 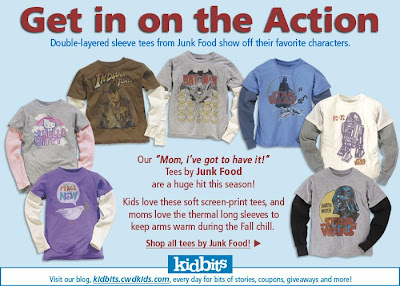 CWDkids has the best in Action Hero tees from the summers biggest blockbusters! From Star Wars, R2D2 and Darth Vader to Indiana Jones to comic book heros Batman and Spiderman... it will be hard to choose just one! For girls, Hello Kitty and Peace Now tees in terrific pinks and purples fit the bill. Don't miss our "Mom, I've got to have it" tees by Junk Food. Order now before they are gone! Meet one of our newest and most popular brands, Flowers by Zoe. Flowers by Zoe is a fashion forward children's clothing collection that started in the mid-80's. The collection started with just a few pieces and has grown into a 600 piece collection! Best known for their beautiful lycra prints, they appeal to all different tastes because of their wide variety of styles. Flowers by Zoe can be seen on many celebrity children... Brooke Shields was recently spotted with her daughters in Disney World in Flowers by Zoe. From casual looks to dressy styles like the holiday sequin dress that CWDkids is carrying now, they offer trendy, stylish looks while still remaning age-appropriate. Halloween is just over a month away, but your kids will want to wear our adorable outfits all October. 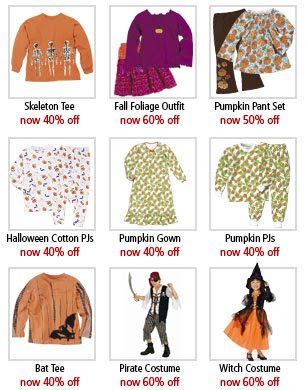 From scary to silly, we have the best choices in kids Halloween clothing and many of them are on sale now! An don't miss the cute costumes we are carrying this year in addition to our popular holiday themed styles for boys and girls. We know... it usually rains cats and dogs, but this year, we have found horses and pirates to be more popular. Best of all, they are PVC Free which we know is important when you are buying for your kids! Hatley, started as a cottage business (literally in a cottage). Johan and Alice Oldland had moved to a small town to pursue a less complicated life for themselves and their three boys. Alice, an artist, put her artwork on aprons and before they knew it they had a very successful business that just kept growing. Their boys grew up, pursued careers themselves, then ten years ago sent their parents packing for early retirement and set about breathing new life into the Hatley line. CWDkids offers Hatley raingear because it is safe for your kids! Several years ago they replaced all their PVC raincoats with polyurethane. Rather than reducing harmful chemicals such as phalates to "acceptable" levels, they chose to eliminate them altogether! Hatley uses all natural fibers whenever possible. Rubber and synthetics are used out of necessity as cotton doesn't keep you dry in a raincoat! They also use 100% azo-free dyes and non-cholorine bleach. Azo dyes do not biodegrade. We LOVE working with a company that thinks about the safety and health of kids as well as the environment... and is fashionable to (rain)boot! and save when you buy 2 or more of any one style! "Hoo" looks adorable? 3 1/2 year old Riley trying on one of her new Fall Outfits, by Mis-tee-v-us from CWDkids! "The 2009 style is very vogue! I think it will be lots more comfortable and is somthing the girls can wear off the beach and elsewhere if needed. Great idea!" Juju - please email us by Friday Sept, 19 at support@cwdkids.com and let us know where to send your prize... a great tote bag from Vineyard Vines! The best thing about my responsibilities is that every day is something different! The day begins early, getting my 17 year old off to school. This is the first time in 18 years I am not carpooling a child to school! As Chris drives away, I put the odiferous soccer clothes into the wash, grab some coffee, take something out of the freezer for dinner, dress and I am out the door. I know it’s odd to think about dinner at 7:00am, but my 20 year old son Andy is coming home for the evening. I know he’ll enjoy a home cooked meal! 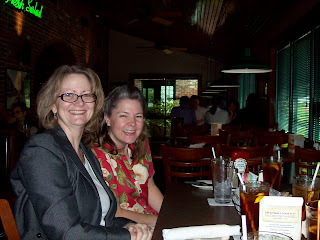 You can see Andy and Chris on our blog posting of June 9th. At my desk, the office day begins reading and responding to emails and voice mails. After this is completed, the first order of business is reviewing orders that are ready to be sent for Spring 2009. Yes, Spring 2009. We are 75% complete with selecting and designing the wonderful styles we will offer next spring. We have a Wednesday staff meeting with the heads of each area. We discuss catalog mail dates, photography locations, email/ad schedules, customer service comments as well as our thoughts for the spring season. Time for my second cup of coffee! The next item of the day is looking at new merchandise, a style out with the buyers. A style out meeting is where we review any new samples for the next season, in this case Spring 2009. We have a large room where we hang each sample needing review. We discuss the fashion trend, target age range, pricing and the ability to reorder. If the consensus is a yes that this is a CWDkids selection, the buyer will proceed with communicating the selection to the manufacture and writing the order. Lunch today is a company event as our Customer Service Manager is leaving. 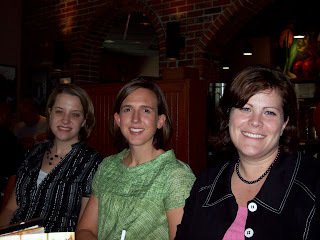 After ten years with CWDkids, Kelley is moving to Ohio. She will be missed! Back to my desk, I read and respond to the next batch of emails and calls. The inventory report is the task awaiting my attention, reviewing current Fall selling. What do we need to reorder, how many units per size and how fast can we get them to our warehouse? The inventory report used to make these determinations is 300 pages. Needless to say it takes some time and concentration to assess our needs, discuss with the various manufactures and give the order to our rebuyer. The results of the report will be sent to the creative department, the marketing area and inventory control. It is emailed in one spreadsheet, very efficient! One last look at my emails to make sure all have been responded to! As I head out the CWDkids door, I have my list of things I need to pick up on my way home. I can’t wait to have Tom, Andy, and Chris all home for dinner. I need to remember to put those clothes in the dryer! As you can see, being a merchant involves creativity as well as multitasking, good communication, knowing your customer, and a lot of numbers! I can’t wait to see what tomorrow will bring! I am a big sports fan, especially UVA. Go Hoos! My passion is gardening. I completed the Master Gardener Program in 1992. “I can not live with out books” Thomas Jefferson. Totally agree…books and music! 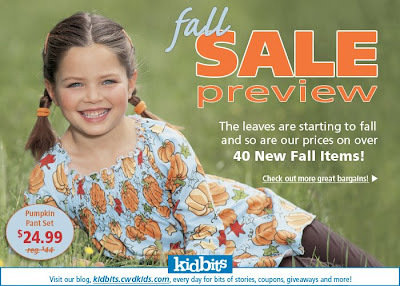 Blog readers are the first to know about the new Fall merchandise that CWDkids has marked down. We know that your kids need new clothing as the weather gets cold... why not get it at a discount? You won't even have to leave your house. Click here to see all of our new sale items. 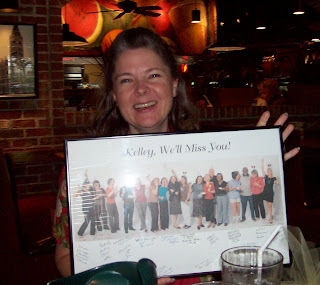 Kelley, our customer service manager, is leaving CWDkids after 12 years. 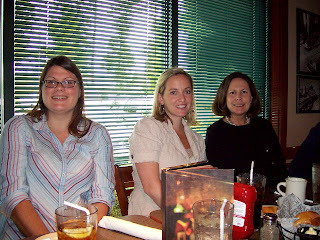 We have been so lucky to have had Kelley with us for so long. 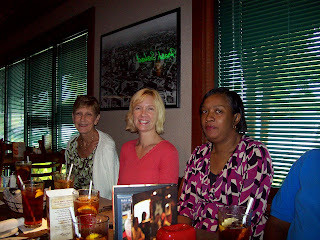 We will miss her! Help Us Decide & You Might Win A Secret Prize! We know how much parents love the UV protection of our wetsuits and rashguards. 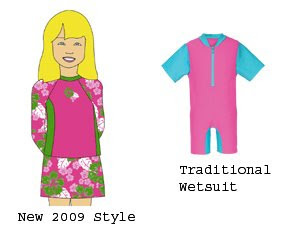 For Spring 2009, we are thinking of offering a new 2 piece style for girls. The new style will have a skirt bottom with attached brief. Potty Training - A Shout Out to Elastic! We have posted this info before, but just saw a great article on mykindofmom.com (thanks for mentioning our Wes & Willy twill pant!) about tools to increase your toddler's independence so we thought a re-post was in order! As parents, you know how hard it is to wrangle your little ones into an outfit every morning. We get emails and letters (and now blog comments) from customers all the time telling us how much they appreciate that most of our pants and shorts feature elastic waists. From cargo shorts to corduroy pants, bike shorts to leggings, click here to see some of our most popular elastic waist styles for boys and girls. Below are just a few of the most popular reasons customers say they love elastic waists. Let us know if you have any others to add to the list! Elastic is more comfortable according to all kidsWe also received several comments to our Gold Star Giveaway post from customers who want to see more adjustable waists. Many of the Polo Ralph Lauren and E-Land Kids styles have adjustable waists in some, if not all, sizes. This feature will be noted in the copy when available. We will keep all of your comments in mind when looking for new styles in the future so keep 'em coming! School Stories - What a First Day! This story was emailed to our VP of Marketing by one of her friends outlining her daughter's first day of Kindergarten. We hope that your kids first day of school was not nearly as dramatic. Please comment on the post and tell us your first day story! Because you never want to let on to your child that this can possibly happen, I have to type this in an e-mail rather than call any of you with the "real" story of how bus pick up went on our first day of kindergarten. I waited for the bus at 2:15 -- it pulled up at 2:20 and two children got off. Note that three got on that morning. Well, K. was not one of those who got off, so I asked the bus driver if he had K. He consulted his list and though he had her on his list, he seemed to not actually have anyone answering to that name on his bus. I was not yet in a complete state of panic as our transportation department has assigned her to a stupid bus stop in the first place and I had initiated having it changed to the one that makes more sense based on how our neighborhood is laid out this morning. So I thought there was a chance that she had somehow been put on the other bus -- I'd told my neighbor to keep an eye out for her and told the bus driver to radio that bus and see if she was there. He radioed around a bit and I called the school -- it wasn't until the other bus said they did not have her that I really started to completely freak out!!! So, I had to call B. (husband) in tears to tell him that our daughter is missing and to go to the school to be there in case she is there -- I call my neighbor who tells me that she doesn't have K., I call anyone I can think of. Finally, the school calls to tell me that K. got "mis-sorted" by one of the parent volunteers and was never actually put on the bus and is happily chatting it up with the office ladies. Huge relief!!! So, all is well that ends well -- what a dramatic day. Fortunately, by the time B. got home with the happy kindergartener I was back together again. She is totally unaware of all the chaos that went on -- thank goodness. I had visions of forever driving her to school. Other than that -- she seems to have had a great day and only seemed disappointed that she did not get to ride the bus this afternoon. I now have enough adrenaline to run a marathon - I should put it to good use and go work out or clean the house or something but I think the girls are staging a birthday celebration for me! Here are a couple of our favorite back to school stories from other blogs. 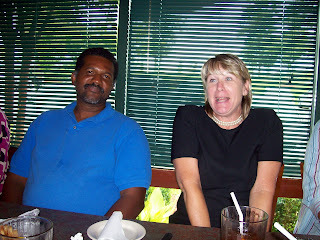 If you have your own blog with a great back to school story, please post the link in comments! Don't miss the discount code in our post from 9/4/08... scroll down to see details! Almost everyday at lunch I can be seen eating a turkey sandwich with pretzels and playing Spider Solitaire. Ready to shop for Fall? Use either one of these discounts created for our blog readers now through Monday September 8! Enter coupon code CEXBLG to take $25 off an order of $200 or more! Enter coupon code CEXKID to take $10 off an order of $100 or more! Please note, the dollar amount includes merchandise only...shipping charges and tax do not count toward the minimum thresholds. Cannot be combined with any other promotions. Cannot be used on previous or pending purchases. Offer expires midnight EST 9/9/08. 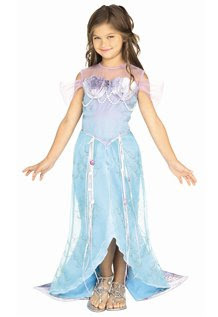 This year we are offering Halloween Costumes at cwdkids.com! You can only order these items online.....and quantities are limited, so don't wait! We also carry other fun items like a Witches Hat, Firemans Hat, Chaps & Vest Set, and Skirt & Vest Set, which can be worn as Halloween Costumes, or just for fun dress-up anytime! Remember how exciting Halloween was as a child? The anticipation of dressing up as your favorite character, school costume parades, pumpkin carving, and (of course) trick-or-treating? Well...why limit all that fun to one day? 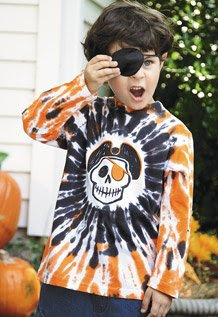 At CWDkids we carry Halloween theme T-Shirts and Halloween Outfits that your kids can wear all month long to celebrate! We have something for everyone with Candy Corn Dresses, Baseball Skeletons, Witchy Girl Tees, Pirate Pumpkins, and more. Treat your little goblins to some sugar-free treats to put them in the Halloween spirit! But don't wait....October is approaching quickly! Nighttime is the perfect time to show off your kids spooky spirit! Halloween pajamas and nightgowns are guaranteed to put a smile on your little jack-o-lanterns face... going to bed has never been so much fun! 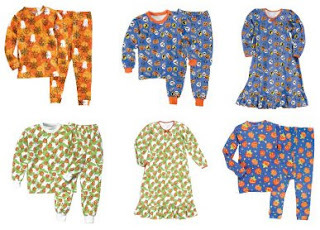 Choose the spdr and pmkn patterns from our CWDkids' sleepwear page. We also have terrific patterns from Sara's Prints. We thought that everyone else would be wishing you a Happy Labor Day, so we decided that a different message was in order. School is starting and we know you are busy with everything that comes along with it, but October will be here before you know it. You will need to order early to get the best kids clothing, costumes and accessories so that they can begin wearing them on October 1. This week, we will be celebrating the spooky with posts about all the Halloween gear your boys and girls will need to celebrate the season in style. Enjoy and please comment on any of these posts if there are Halloween items that you wish we would carry in the future. We welcome your feedback and suggestions. Today we would like to highlight the small stuff... accessories and shoes that make great gifts and will help put the finishing touches on outfits or costumes. Click the links below to purchase any of these great accessories or shoes.